How to Get a Flat Tummy Postpartum; Even After a C-section! If you are anything like me, you have been wondering if your belly will ever look the same. I wondered this as my tummy grew larger and larger throughout pregnancy. Once I heard the news that I was going to have a C-section to delivery my little bundle of joy I was even more nervous. Will your tummy ever be the same? The answer: maybe and maybe not. Most of us will always have some extra skin, and it won’t be as tight, but you can still get back into your skinny jeans and lose the muffin top! Here are my 8 tips for a flat tummy after having a baby or C-section. The first step to getting a flat tummy after a C-section is to be patient. Just like everyone tells you, it is going to take time. It takes time for all of your organs and muscles to move back into place after being pregnant. It took nine months for your body to stretch and prepare for baby, so don’t fret if you’re not completely back to normal for nine months after baby is born. Month by month I noticed more and more progress. Now I’m 1 year Postpartum and seeing the most change. Now, when you have a C-section, you can’t get up and move immediately but every day you can do something to move your body. As soon as you’re feeling up to it, take your baby for a walk. Walking is not only great exercise, it is great to get fresh air and stretch your legs which will motivate you to move more. As soon as you’re feeling up to it, I recommend walking daily for 30 to 60 minutes. Another great way to start moving again is doing yoga while your baby is practicing tummy time. As time goes on and your doctor approves working out again, you can involve baby in workout time. There are many exercises you can do that baby actually loves to be a part of. Holding your baby while doing squats and lunges are a great added resistance to your workout. Also, Burpee’s and push-ups are a great way to interact with baby and add a few extra kisses while your baby is lying on the floor. My little one actually loved to take a nap while I worked out. He would always fall sleep watching me. For those who are new to the term, your pelvic floor muscles support your bladder, bowels and uterus. Pregnancy and childbirth can weaken these muscles, but exercises can rebuild their strength. Now this does not mean to get down on the floor and start doing 1 million crunches right off the bat! That can actually be counter intuitive right after having a baby. What this does means is as soon as your C-section has healed enough that your abs do not get sore while doing daily activities, start focusing on your core muscles and pulling them inward throughout the day. This is not the same as sucking in. This is using your transverse abdominal muscle, which is the muscle deep inside of your abs. Focus on doing this movement of pulling inward multiple times a day. As your abs get stronger again, you can start doing 30 second abdominal holds. This is when you look into a mirror, inhale, then exhale while pulling your transverse abdominal in tight. Hold for 30 seconds working up to doing this, four-to-six reps at a time. This is important for mommies to repair after their body has gone through such a change. Whenever your body is injured, you need to make sure you eat enough nutrients and calories to heal. As a new mommy, you also need energy which comes from calories. For those of you who decided to nurse your baby, you also need to add an additional 300 to 500 calories to your daily maintenance calories. Begin by determining the amount of calories you burn each day and start by adding 300calories and see how you feel. Adjust from there. You do not need to eat in a calorie deficit to get a flat tummy at this time. My “go to” saying is: eat healthy 80% of the time. Always choose wholesome, natural foods. Save your treats for only a few times a week. Abs and flat tummies are really made in the kitchen, not spending hours and hours a day on the elliptical. Eating healthy is really the best thing you can do for yourself at this time! Once you are feeling like you have plenty of energy again, and you are ready to fully get back on a workout schedule, add in resistance training. 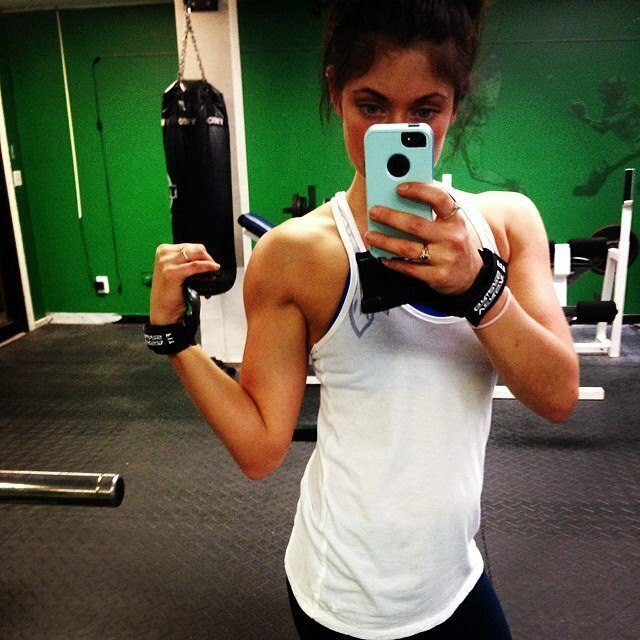 Using exercise bands and weights a few times a week in your workouts will give you great results! Don’t under estimate the power of small 10-20 minute workouts. I hear a lot of women say they don’t have time to work out. Well just because you don’t have a whole hour to spend going to the gym is NOT an excuse. Working out at home for 20 minutes will offer just as many benefits as a long gym session. Resistance bands are also very affordable! Since lean muscle mass is really the key to burning fat, don’t skip your resistance sessions! This seems like the easiest one to do but yet the hardest to follow through with. If you become thirsty, you are not drinking enough water. Drinking water will flush out any of the nasty stuff hanging around and keep you from getting bloated. Digestion is one of the keys to a flat belly. I recommend taking a probiotic daily and eating lots of fiber. By adding veggies and leafy greens to two meals or more meals a day your fiber will be greatly increased leaving your belly feeling flatter in no time! So there you have it! 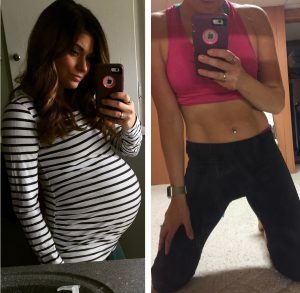 This is how I got my tummy back after my pregnancy. Let us know in the comments below if you did anything else that helped you get your Postpartum body back? 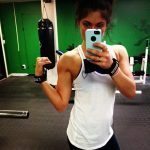 Kaylee Schwechheimer is the creator of The Fit Mommy Online, where she shares her passion for fitness, nutrition, and cosmetology all while juggling her favorite job, being a mom.